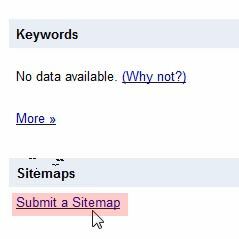 How to submit your wordpress blog or website and sitemap.xml then verify it in Google webmaster tools to get better indexing. This is a must to do, if you want your wordpress blog visible to anyone out there, and want it to be found in Google search engine. This is one of the reasons i love wordpress, because it has a plugin which can build an XML file to help you to create a sitemap, for free. 1. Your default permalinks have been changed to more search engine friendly ones. 2. Optimize your blog’s meta tag, description and optimize your blog post with All in SEO pack plugin or any other plugin you choose. 3. You already have created sitemap.xml file. It is usually can be found when you type: yoursite.com/sitemap.xml in your browser. 4. Add your URL to Google addURL site. Here is the quick link. 5. You have a gmail account. Let’s submit our blog to webmaster tool! 1. First step, go to google webmaster tool, and use your gmail account to sign in. 2. Once you are logged in, you will see an empty page where it says “Home” and empty site list. Empty home with "add a site" button. 3. Click “Add a site button” type in your domain name, www.yourdomainname.com, and hit “Continue” button. 4. Now, of course you will see your “Verification Status” is “Not Verfified”. We have to verify our site with copying and pasting “Meta Tag” code or uploading file. This tutorial is going to copy and paste the code. 5. So copy the code and go to your dashboard and look for “header.php”. Where the code will be pasted. 6. Back to Google webmaster tool, click “Verify” button. Your site should be verified. 7. Now we are going to submit our sitemap.xml file too. 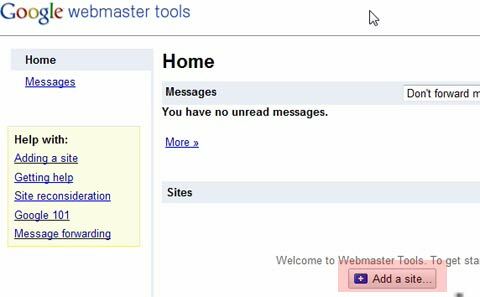 Click “Google webmaster tools” logo. Click the logo, red highlighted. 8. In “Home” page of webmaster tools, click the link to your site. Type in "sitemap.xml" in the box. 10. It will say pending or it will have a small clock icon, it means it is still pending. Now time to build links for your blog, and it will help to get indexed fast. 2. Different with steps above, once you click “Continue” button you don’t need to verified, because it is already verified. 3. One thing to do is go back to Home of webmaster tools, and click your site link with www. 4. 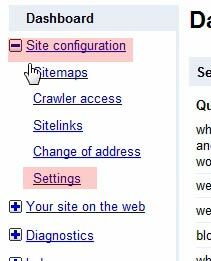 Once you clicked the site link you will see in the left sidebar a “Site configuration” button, click the “+” button, and find “Settings”. Click this button. 5. You should see “preferred domain” options. 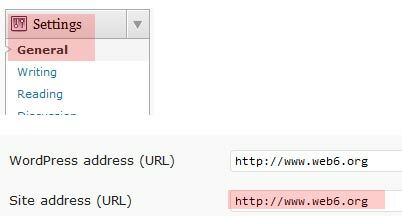 Be careful, choose the option which matches in General settings of your blog’s address URL in dashboard. Take a look at your general setting first. So in the webmaster tool preferred domain, i choose “Display URLs as www.web6.org”. After i checked in gerenal setting i prefer whichever matches to the site's URL. If i would have http://web6.org in my dashboard wordpress general setting, i would choose “Display URLs as web6.org. Wheww i guess this post is the longest post i have ever wrote, but i hope it will help you to submit your wordpress blog and sitemap.xml file to Google webmaster tool, and get it verified so it’s possible for people to find your posts via Google. Time to build relevant links for your blog to be displayed in the first pages of Google! All your posts are so useful and well put! Thank-you yet again. I wish I had found this blog out sooner. Link backs coming your way miss! another Q, when u say domain name..what does it actually mean? is it still my site url, the one that has ‘local host’? sorry for bugging u again and again and thanx! Domain name, in my case, my domain name is web6.org, and my subdomain is blog.web6.org (this blog). Yes, they are my blogs’s URL. In your case, localhost is your server name. Hi Kimi – Once more, HUGE thanks for giving a simple, clear answer to a question I have been scratching my head over. It’s so easy when you know how! Your Blog is just so useful – I shall continue to spread the word. PS. I have a chocolate website – would love to send some as a Thank You. Where are you based?? Feel free to check: https://www.wpvidz.com/sitemap/ for more wordpress tutorials, this page will probably help you better to look for some posts. You know where to email me whenever you need a help, i will definitely glad to help if i can. For, the chocolate, i am based in Germany, but i guess the sending costs will be very expensive, if you ever visit Germany, you can bring some! Thank you for answering my last questions. do you think that instead of adding the site twice then configuring it. You could just add an .htaccsess file in your root with a 301 redirect and just add the site once? do you think it will work the same? Hey Oscar, I do both actually, .htaccess and confirm two address in webmaster tool. Doing it in webmaster tool is enough, and telling Google to only indexing the preferred domain. Since editing .htaccess is not recommended, unless you know about it, so i give the easier option in webmaster tool preferred domain settings. Do i have to worry about that on my blog. or does all in one seo pack take care of that automatically?? or maybe the twenty ten theme has something inside to fix any duplicate content worries. What does AIO plugin take care of that automatically? submitting to Google? no, we have to do this. All In One plugin helps us in putting keywords, description, etc in post and pages but won’t submit anything. Actually duplicate content is a myth nowadays, don’t have too much worried about it, just don’t post exactly the same post or pages in your site. No, I mean does AIO guard against duplicate content automatically? 1.If not, what code do i insert into the htaccess.? 2. or to make things easier what plugin can i use to insert a 301 redirect code to guard against duplicate content? 3. what do you think about this plugin? Yes, AIO will take care of it, once you installed it, it has an option ↑ “canonical URL” leave it checked. see more: https://www.wpvidz.com/wordpress-set-up-all-in-one-seo-pack-configuration-tutorial/ (number 2). 1. I would not put anything in .htaccess because if you install cache plugin, it can disturb redirection. It is not necessary anway. It is already taken care by your URL settings, see more here: https://www.wpvidz.com/what-to-do-after-installing-wordpress/ (number 9). 2. I would not install any plugins for this. 3. I have no idea about this plugin, i have never tried it, and then i would not install it. here is a link that explains the plugin above better. Looks great, but i would not install it. Noticed, the post was made in 2009. Why not to put a 301 redirect to this hustle of www and non-www and how to put 301 redirect for both wordpress and blogspot blogs? I just wanted to thank you. Your posts are SO HELPFUL!!! !